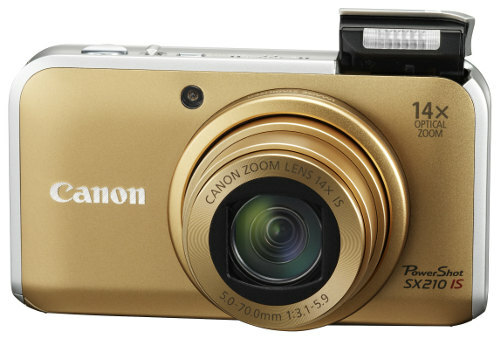 The Canon PowerShot SX210 is a stylish compact super-zoom with an impressive feature set. However, shooting performance leaves one wanting more. With good overall image quality, the SX210 is a competitive model in this category. Read more in our Full Conclusion. Canon has upgraded the SX200 from last year with their latest compact super-zoom, the SX210 IS. This new unit offers 14-megapixels of resolution mated to a powerful 14x optical zoom lens that features a wide 28mm field of view and their true optical image stabilization. Other specs include a large 3.0-inch LCD screen, hidden pop-up flash unit, Eye-Fi card compatibility, and 720p HD video capture. All of these impressive features are packed into a compact and stylish frame that will retail for approx. $349.99US, and is available in three colors: black, purple and gold.